Back around 1998, I arrived in a movie theater a good bit before showtime. Way back then, theaters played music while the lights were on before the show, instead of product advertisements, trivia slides, and Army recruiting spots. That's not necessarily bad, but one nice thing about the movie theater experience is the sound system, as long as you're not subjected to Britney Spears. Such was not the case. A song started which captivated me for whatever reason, its long musical introduction amplified throughout the space. It was like a 5,000 sq.ft. set of headphones. That song was "Bittersweet Symphony" by The Verve, and every time I've heard it since it hasn't quite reached the majesty of the first experience. I later listened to the album on which it was included, and it had its moments, although it was an uneven effort overall. Alas. The group's principle singer and songwriter went on to record several solo recordings, the first of which, "Alone with Everybody," had much of the same sonic signature (strings, brass, electronic chirps, and other goodies) that were similar to "Bittersweet," such as "Song for the Lovers." However, subsequent releases found him going through the motions and seemingly searching for something to say and an interesting way to say it (not a good thing). So here we are 10 years later, and The Verve has reunited, which was no small thing due to the arguments and egos that ultimately doomed them (and so many other bands). 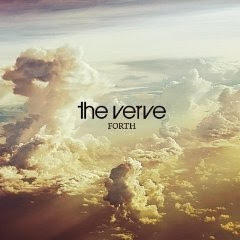 "Forth" is not the album that I wanted it to be. I had hoped it would reclaim the potential that they had only touched upon. Ashcroft has always tended to be anthemic in his writing, and if the reunion could rekindle decent lyrics and pair them with appropriate music, good things could result. Unfortunately, "Forth" is also uneven. It starts well enough with "Sit and Wonder" and then moves to their single, "Love is Noise." The title sort of stops you, taking something that one likes and mixing it with what one does not. It's a great song, except for the main musical refrain that sounds like "uh oh, uh oh, uh oh" (though it may to different ears sound like "uh huh..."). It just becomes annoying, ultimately ruining something that I'd otherwise like to hear again. And then things never quite recover. The songs sound a bit neglected, as if the band recorded extended versions intending to go back for a judicious edit that never happened. I have nothing against longer songs, and, in fact, enjoy them, as long as there is something to maintain interest - a musical diversion, a change of pace, etc. These just last too long, becoming quite tired in their repetitions by the end. To a degree, reuniting the band helps Ashcroft by not being singly responsible for all the lyrics, and the band adds a harder edge to the songs than he would favor on his own. On the other hand, the songs not written by Ashcroft sound compromised, as if Ashcroft's romantic instincts were not welcomed, landing them somewhere in the middle ground of solid rock or ear candy, where one or the other is needed. In short, there's nothing wrong with creating music that requires contemplation, but there is little here that makes any kind of emotional connection or offers a memorable "hook." Despite the big beat, heavy guitars, and anthemic structures, it's a sterile endeavor, which, viewed some years farther down the road, perhaps is the lyrical prediction of "Bittersweet Symphony" itself. Recommended tracks: "Sit and Wonder," "Valium Skies," "Appalachian Springs"